Describe the prevalence of excess gingival display (EGD) and appropriate treatment modalities. List possible etiologies for EGD, and why establishing etiology is clinically important. Explain lip management techniques that can be used to reduce the appearance of EGD. Gingivectomy, clinical crown lengthening, orthodontics, orthognathic surgery, botulinum toxin injections and lip repositioning have been used to correct EGD.3,7–12 Understanding the causes of EGD is ­critical when choosing the most effective treatment modality. The purpose of this article is to discuss the various treatments for EGD — and when each is indicated. Passive eruption refers to the physiologic apical migration of the gingival tissue to within 1 to 2 mm of the cementoenamel junction (CEJ) after the tooth fully erupts into position. Altered passive eruption (APE) occurs when there is a lack of this physiologic recession.6 The pathogenesis of APE is not fully understood, but the presence of thick, fibrotic gingiva has been proposed as a possible factor.13 Coslet et al14 classified APE into four categories based on the amount of attached gingiva and distance of the osseous crest to the CEJ. This classification acts as guideline in determining when surgical excision of excess gingiva, osseous surgery, and/or an apically positioned flap is required. Gingival enlargement occurs when there is a pathologic overgrowth of the gingiva that covers the anatomic crown.6 Both APE and gingival enlargement can result in EGD. Gingivectomy is indicated when there is an adequate amount of attached gingiva covering the anatomic crown. (Figure 1 and Figure 2). In this procedure, EGD is reduced by surgical excision of the excess unattached gingiva, thereby repositioning the gingival margin in an apical direction. FIGURE 1. Preoperative view of a patient with altered passive eruption. FIGURE 2. Postoperative view two weeks following a gingivectomy. Excess gingival display has been eliminated by removing excess unattached gingiva. While gingivectomies are an in-office surgical procedure with minimal morbidity, a limitation of this approach is that gingival display reduction is limited by the length of the anatomic crown and distance of the osseous crest to the CEJ. Clinical crown lengthening is a surgical procedure in which gingival and osseous tissue is removed to expose more clinical tooth structure.6 Coslet et al14 and Kois15 described patients with high crestal bone levels in close proximity to the CEJ. Clinical crown lengthening is indicated when crestal bone levels must be recontoured to move the gingival margin apically, achieve stable gingival margin levels, and accommodate the biologic width.16 At times, the periodontium is so thick and bulbous the alveolar ridge needs to be reduced to achieve the desired results.8 If restorations are not intended, GD reduction will be limited to prevent exposure of root surfaces. FIGURE 3. Preoperative view of a patient with anterior dentoalveolar extrusion. FIGURE 4. 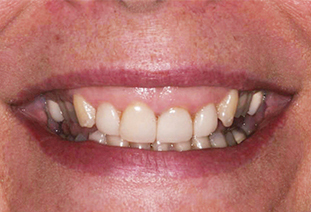 Postoperative view following clinical crown lengthening and restoration of maxillary incisors. Gingival display has been reduced by apical movement of the gingival margin. When new restorations are intended, incidental root exposure does not present a contraindication to apical movement of the gingival margin. Root structure that is exposed will be covered by the restorations (Figure 3 and Figure 4). In these cases, the limiting factor in reducing GD lies in not exceeding esthetic tooth proportions and compromising the stability of the dentition.17,18 Root structure exposure may be expected to occur in cases in which there is significant tooth wear or dentoalveolar extrusion, and with VME. Clinical crown lengthening is an in-office surgical procedure that is associated with minimal morbidity. FIGURE 5. Preoperative view of a patient with excessive maxillary lip movement. FIGURE 6. Postoperative view six months after lip repositioning surgery. 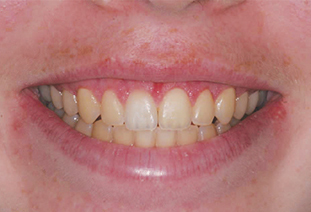 Excess gingival display has been eliminated, and the maxillary lip appears more full. As noted in this paper, clinicians can choose from a variety of treatments for managing EGD. Depending on the condition’s etiology, one therapy may be indicated above others. Thus, understanding the etiologies of EGD — and the available corrective remedies — will help clinicians reach the best treatment decisions. Allen EP. Use of mucogingival surgical procedures to enhance esthetics. Dent Clin North Am. 1988;32:307–330. Kokich VO Jr, Kiyak HA, Shapiro PA. Comparing the perception of dentists and lay people to altered dental esthetics. J Esthet Dent. 1999;11:311–324. Bhola M, Fairbairn PJ, Kolhatkar S, Chu SJ, Morris T, de Campos M. LipStaT: The lip stabilization technique — Indications and guidelines for case selection and classification of excessive gingival display. Int ­J Periodontics Restorative Dent. 2015;35:549–559. Tjan AH, Miller GD, The JG. Some esthetic factors in a smile. J Prosthet Dent. 1984;51:24–28. Dong JK, Jin TH, Cho HW, Oh SC. The esthetics of the smile: a review of some recent studies. Int J Prosthodont. 1999;12:9–19. Robbins JW. Differential diagnosis and treatment of excess gingival display. Pract Periodontics Aesthet Dent. 1999;11:265–272. Glassman S. Cosmetic treatment of the gummy smile. Contemp Esthetics Restorat Pract. 2001;5:58–61. Polack MA, Mahn DH. Biotype change for the esthetic rehabilitation of the smile. J Esthet Rest Dent. 2013;25:177–186. 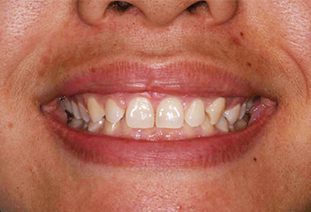 Rui S, Huang L, Bai D. Adult class II division 1 patient with severe gummy smile treated with temporary anchorage devices. Am J Orthod Dentofacial Orthop. 2011;140:97–105. Zahrani AA. Correction of vertical maxillary excess by superior repositioning of the maxilla. Saudi Med J. 2010;31:695–702. Polo M. Botulinum toxin type A in the treatment of excessive gingival display. Am J Orthod Dentofacial Orthop. 2005;127:214–218. Mahn DH. Lip repositioning to eliminate the gummy smile. Inside Dent. 2017;13:50–55. Volchansky A, Cleaton-Jones PE. Delayed passive eruption. A predisposing factor to Vincent’s infection? J Dent Asso S Africa. 1974;29:291–294. Coslet GJ, Vanarsdall R, Weisgold A. Diagnosis and classification of delayed passive eruption of the dentogingival junction in the adult. Alpha Omegan. 1977;10:24–28. Kois JC. Altering gingival levels: The restorative connection. part 1: biologic variables. J Esthet Rest Dent. 1994;6:3–7. Lanning SK, Waldrop TC, Gunsolley JC, Maynard JG. Surgical crown lengthening: evaluation of the biological width. J Periodontol. 2003;74:468–474. Chu SJ, Hochman MN. A biometric approach to aesthetic crown lengthening: part I — midfacial considerations. Pract Proced Aesthet Dent. 2008;20:17–24. Hempton TJ, Dominici JT. Contemporary crown-lengthening therapy: a review. J Am Dent Assoc. 2010;141:647–655. Kaku M, Kojima S, Sumi H, et al. Gummy smile and facial profile correction using miniscrew anchorage. Angle Orthodont. 2012; 82:170–177. Paik CH, Park HS, Ahn HW. Treatment of vertical maxillary excess without open bite in a skeletal class II hyperdivergent patient. Angle Orthodont. 2017;87:625–633. Garber DA, Salama MA. The aesthetic smile: diagnosis and treatment. Periodontol 2000. 1996;11:18–28. Neal CE, Kiyak HA. Patient perceptions of pain, parasthesia, and swelling after orthognathic surgery. Int J Adult Orthodon Surg. 1991;6:169–181. Rodrigo C. Anesthetic considerations for orthognathic surgery with evaluation of difficult intubation and technique for hypotensive anesthesia. Anesth Prog. 2000;47:151–156. Mazzuco R, Hexsel D. Gummy smile and botulinum toxin: a new approach based on the gingival exposure area. J Am Acad Dermatol. 2010;63:1042–1051. Gabrić Pandurić D, Blašković M, Brozović J, Sušić. 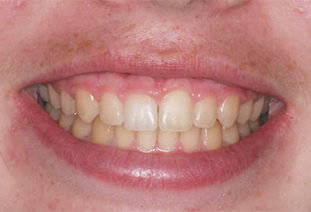 Surgical treatment of excessive gingival display using lip repositioning technique and laser gingivectomy as an alternative to orthognathic surgery. J Oral Maxillofac Surg. 2014;72:404.e1–404.e11. Mahn DH. 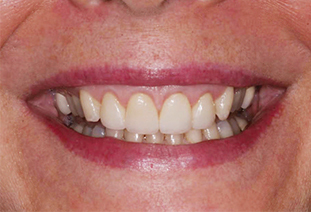 Elimination of a “gummy” smile with crown lengthening and lip repositioning. Compend Contin Educ Dent. 2016;37:52–55. Rubinstein AM, Kostianovsky AS. Cosmetic surgery for the malformation of the laugh; original technique (in Spanish). Prensa Med Argent. 1973;60:952. Rosentblatt A, Simon Z. Lip repositioning for reduction of excessive gingival display: A clinical report. Int J Periodontics Restorative Dent. 2006;26:433–437. Simon Z, Rosenblatt A, Dorfman W. Eliminating a gummy smile with surgical lip repositioning. Cosmet Dent. 2007;23:100–108. Humayun N, Kolhatkar S, Souiyas J, Bhola M. Mucosal coronally positioned flap for the management of excessive gingival display in the presence of hypermobility of the upper lip and vertical maxillary excess. A case report. J Periodontol. 2010;81:1858–1863. Silva CO, Ribeiro-Júnior NV, Campos TV, Rodrigues JG, Tatakis DN. 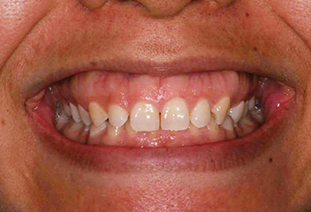 Excessive gingival display: Treatment by a modified lip repositioning technique. J Clin Periodontol. 2013;40:260–265. From Decisions in Dentistry. June 2018;4(6):30–32,35.